Moving business computing needs to a high-performance Cloud solution is an exciting prospect that promises to revolutionize every process in the organization. Reliable backup storage, disaster recovery & redundancy, secure data access, scalability & high availability are few challenges with the existing on-premises infrastructure environment. This demands the need of extending or integrating their applications with Cloud to deploy game-changing solutions. However, just like any major organizational change, migrating to an Azure platform is not without growing pains. 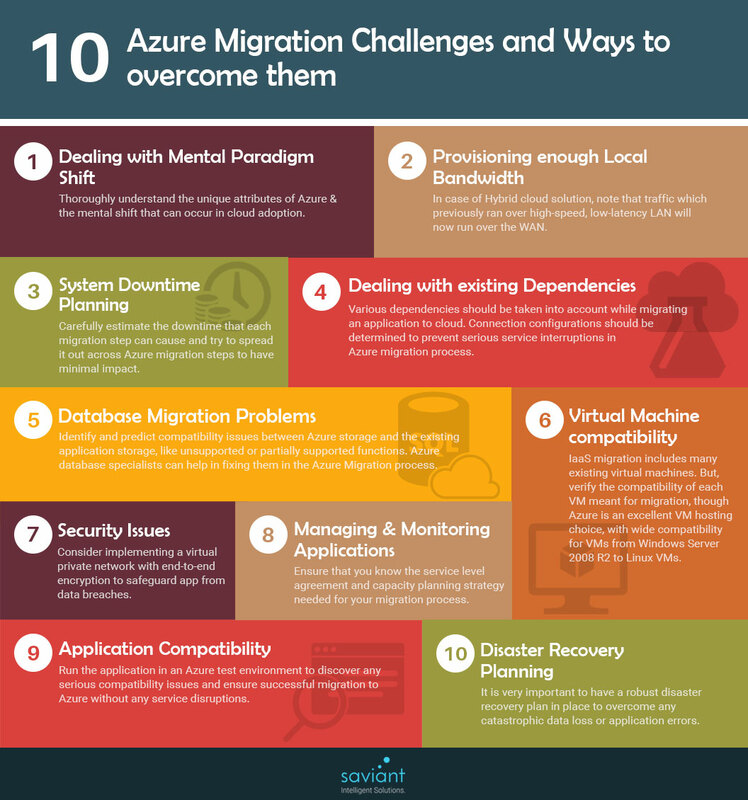 Here are the ten challenges and ways to overcome them while planning for an Azure migration. The key challenge at the centre of Azure migration comes from misunderstanding the differences between applications hosted on cloud and traditional local deployments. There are many concepts that are unique to the cloud and capacity planning and resource management are conceptualized differently, as one example. The bottom line is that whoever is managing the migration needs to understand the unique attributes of Azure as a cloud platform and the mental shift that needs to occur when developing in the cloud. One of the most overlooked issues when migrating to an IaaS platform like Azure is how much bandwidth provisioning is needed. This is especially important if a hybrid cloud solution is in use. There may be a lot of traffic running between locally hosted systems and remote cloud elements in such a case. Hence, it should be noted that traffic which previously ran over high-speed, low-latency LAN will now run over the WAN. Local bandwidth therefore becomes a bottleneck. An architecture specialist experienced in Azure migration services is useful in calculating the cost-benefit impact these bandwidth changes create. When making a major migration downtime is inevitable. Eliminating all downtime is a fantasy, so it is better to accept that there will be downtime and plan for it accordingly. Carefully estimate how much downtime each step of migration will cause and try to spread it out and schedule it to have minimal impact. Applications these days seldom operate in a vacuum. When migrating an application to cloud, dependencies should be taken into account. There are various connection configurations that may be invalidated by the move and so these should be determined before taking the plunge to prevent serious service interruptions. Many enterprise applications depend on external databases in order to complete their functions. While it is possible to migrate applications to Azure while hosting the database in-house, moving the database itself to Azure is an attractive proposition and has many benefits. However, it is very important to identify and predict compatibility issues between Azure storage and the existing application storage. Incompatibilities with supported commands or variable types is possible where the source database was created with now obsolete versions of database software. Converting the database without a loss of fidelity or function often requires changes to applications and the services of database specialists prior to moving to Azure. The adoption of VMs by the enterprises has been astounding and so it is very likely that any IaaS migration will include a number of existing virtual machines. While Azure is an excellent VM hosting choice and has wide compatibility with VMs from Windows Server 2008 R2 and quite a few Linux VMs, it is a prudent idea to verify compatibility for each VM meant for migration. One of the main concerns of CIOs when considering moving infrastructure and software outside to a cloud platform is information security. Using secure protocols at the application level is good enough depending on the specific use case, but creation and implementation of a virtual private network with end-to-end encryption is definitely a solution that everyone should consider. Wherever your applications are hosted, you need to have the right processes in place in order to manage those applications effectively. Before you deploy to a production environment in the cloud you will need to ensure that you know what service level agreements you need and what your capacity planning strategy is. How will customer billing work? Where will the data for application monitoring go? Luckily the Azure SDK comes with a diagnostic API that can expose issues with event logs, crash dumps and trace failures. By using the API, it is possible to set up monitoring rules that will make monitoring and planning relatively straightforward. Apart from making sure that databases remain compatible when running on Azure, it is also necessary to ensure that applications are compatible before taking a leap to the cloud. The key to this is testing. Put the application into an Azure test environment and then begin the testing process. It is important that this be thorough, since discovering serious compatibility issues after going to production is very problematic to rectify without major service disruptions. While it is unlikely that catastrophic data loss or application errors attributed to Azure will occur, however it is very important to have a robust disaster recovery plan in place. Azure itself can be used to restore losses if used as a backup solution for local storage. Be sure to study the types of disaster scenarios that are unique to cloud hosting on platforms like Azure and plan accordingly. Underestimating the migration planning scope and requirements is a cardinal sin when migrating to Azure. The key take away should therefore be “measure twice and cut once”, as the adage goes. As an instructive example, an Enterprise migrates its legacy system to Microsoft Azure in IaaS (Infrastructure as a Service) model to make their credit card payment process more stronger. With the successful Azure migration solution, the enterprise was able to add extra layers of security, achieve zero downtime & zero data loss and cut costs by 75%. Migrating to Azure can be challenging. Let our experts simplify things for you. Talk to our Azure Specialist today!